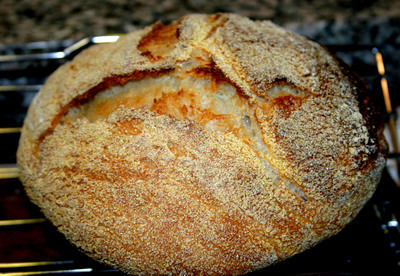 No-Knead Bread: What Took Me So Long? baked innumerable times since. I have been especially tempted by the posts over at Alaska Cooks here and here. Three cups of bread flour, ¼ teaspoon yeast, and 1 ¼ teaspoons salt go into a bowl with 1 5/8 cup water. Stir it around with your hands until it’s mixed and sticky. Cover with plastic wrap and set it aside somewhere room temperature for 12- 18 hours. When it is kind of bubbly on top and makes stretchy threads when you tip the bowl, turn it out onto a floured board. Fold it over like a tri-fold letter a couple of times, then set it on a towel you have dusted with flour, corn meal or wheat bran, sprinkle more of whatever you are using on top of the dough and top with another towel. Let it sit for 2-3 hours until it doubles in size. turn out, even the ones with the fancy ovens. We have two more bowls of dough rising even as I type. Well you’re not the last one at this party because I haven’t made it yet, but I have been thinking about it! Sure looks good in your photo. I’ve been saving this recipe for months but still haven’t gotten around to making it! I’m tempted to start a batch immediately…. Looks amazing. Count me in for the party of folks who haven’t made this bread yet. Should be a good one. Is there any magic to the pot you use to bake it? Kalyn, it looks even better in person because you get that heavenly fresh baked bread aroma! Do it, Lydia. The one problem is that there is no immediate gratification here. You need to do start it now so it’s ready when you want it. Yeah, Ronnie, there is. Since you bake at high temperature, you need to have a pot whose lid can sustain it. We have a couple of Le Creuset Dutch ovens, and Jerry took off the knobs and replaced them with stainless steel. They worked really well. You can also use pyrex or cast iron. Ha! I was just writing a holiday round-up and one of the things I mention is my first taste of no-knead bread as interpreted by my mom. I was always reluctant to try it as I’m a kneading snob and all, but yes, it’s indeed spectacular and a definite keeper. Isn’t it something? I’ve made a half dozen loaves and actually think it’s badly misnamed. It should be something like the Bread with the World’s Best Crust from a Home Oven — so good that you’d be HAPPY to knead if that’s what it took to get it. Nice to see the recipe netted down, I’ve made it often enough now I don’t even use a recipe, just start tossing it together. But. The one difficulty I have is timing, wanting it ready for supper, say. I start at 8pm the night before. Glad it’s a hit, who says that bread-making’s a lost art?!! Alright, alright already, I’ll make the bread! This has got to be the 800th time I’ve seen a reference to it, although I have to admit that your admiration of the bread carries somewhat more weight than that which I’d previously received. Tomorrow, I begin The Bread. I’ve said it before, Lisa, your mom sounds like a cool lady. And I am with you, Alanna. This bread gets a bad rap — it’s not just that it’s a short-cut, it is actually better than any bread I have baked the traditional way. Trouble with tomorrow, Robyn, is that you want it yesterday. The time lag is a problem. How much shorter can you cut the rise, Susan? Twenty hours is a bit of a wait, though worth it. Okay, I’m with Robyn. I’ll cry “uncle” and make this recipe! I’m secretly hoping that I hate it. Otherwise, I see myself eating a loaf of bread with every meal. I’m getting ready for vacation in a few weeks and I don’t want to have to use a wide-angle lens to capture a photo of me on the beach. You can cut the wait by about half, but I know old school purists will challenge it. Rapid Rise (one of a few different brands) is just a more robust, viable yeast strain. According to the Cook’s Illustrated crowd, it performs well and produces virtually identical results. I guess I’m still on my way to the party. Maybe I’m old school, but I just love kneading dough–it’s so relaxing. I am interesting in trying the no-knead type, and you’ve just piqued my curiosity even more. It looks delicious! It’s all your fault. Now I’m obsessed with making this bread. Can’t stop. I now have 4 loaves going for tomorrow, and have already made 3.